CLEVELAND (OHIO CITY) – St. Ignatius’ eight-week soccer-camp series finally made its way back home today, the first day of this week’s youth camp, conducted here in Wasmer Field. Wildcat coach Mike McLaughlin, who has prepped the school to three state championships and one national title here, hosted camps in Avon’s Schwartz Road Park, Westlake’s St. Bernadette School, University Heights’ Wiley Middle School, Macedonia’s St. Barnabas School, Solon’s Dorothy Lewis Elementary School, and Broadview’s Assumption Academy in continuing and sometimes concurrent weeks since June 7. This week’s camp is unique in that it is only for those youth grades K-4. The previous six camps this summer were for youth in the wider K-8 category. The summer series concludes next week with a grades 5-8 camp here in Wasmer. Over 100 participants age 8 and younger today received instruction from McLaughlin, the national high school coach of the year five years ago, and nearly a dozen of his former and current Student/Athletes. Since it is a co-ed camp, McLaughlin also had two female Student/Coaches helping him. The players today did everything from learning basic technical foot skills to playing three versions of the game “Knock Out,” to practicing and playing a penalty kick game, capped off by scrimmaging in world cup soccer play. Among the college Student/Athletes helping in the camp include Iggy alumnus and current Rochester Institute of Technology’s Daniel Holowaty, Iggy alum and Ohio State University club team S/A Denio Leone, and recent Holy Name alumna and soon-to-be Notre Dame College S/A Emily Balodis. Current Wildcats serving as Student/Coaches for the young Student/Athletes this week are Nick Talgan, Max Phatroft, Phill Buzzelli, Max Hallwachs, Cody Dawson, and Jackson Morgan. Also helping is current Holy Name Student/Athlete Fallon Hose. Some of the Student/Instructors did go through the SIHS camp as youth and some went to others, but all have drawn off their youth and high school experiences to offer pointers on how get better at the sport along with providing a fruitful learning experience. Holowaty, whose brother Dennis was the anchor of the defense in last season’s Iggy state runner up team and who will be playing for Marquette in the fall, plays in a program that schedules some of the top Division III programs in the country and is also in a strong math and engineering path academically at RIT. Leone scored the winning goal on Iggy’s state championship team in 2008, but chose the bigger school for academic reasons yet still found a playing situation at the club level. Coming out of one of the most successful girls’ soccer programs in the Cleveland area over the years at HN, Balodis is going into an NDC athletic program that has grown from only four women’s teams 15 years ago to over 20 teams, both men and women, today and will soon be transitioning from NAIA to NCAA Division II. Balodis plans to be an education major so the experience coaching in this camp the past four years is right up her alley. Once getting to the games section of today’s program, campers started off with basic “Knock Out” in which all the players start out dribbling inside a circle and at the same time try to knock another’s ball out of play, knocking him/her out of the game, until one player is left standing and deemed the winner. Then they played “Team Knock Out” in which the object is to hit someone on the opposing team with the ball, a successful shot at the target (opposing team players) knocks those opponents out one-by-one. Whichever team is left with a player or two or more in the circle once the entire other team is eliminated is deemed the winning team. Another version is known as “Smurfs on the Run,” in which players line up on one side of a rectangular box formed with cones. They try to run to the other side in a group without getting hit with a ball from one of two coaches, who are standing on the sidelines. If a camper makes it to the other side, s/he is still in the game. Those knocked out join the coaches in firing balls at the running players, making it more difficult to get to the other side with more balls flying near the feet. The first thing McLaughlin tells the group at large is the major rule that will stick all week. “This is not basketball; this is soccer,” said the coach. Players caught picking up a ball with their hands have to pay the penalty of having to do five special push ups in which they have to touch their balls with their noses all five times before pushing back up through the drill. Scottsdale, Ariz. – For the second straight semester the Oberlin College men’s swimming and diving registered the highest grade point average in the country, the College Swimming Coaches Association of America (CSCAA) announced on June 30. The women’s team, which had three individuals with honors, also earned All-Academic accolades with a 3.26 GPA. The Yeomen’s team GPA of 3.57 was tops in the country regardless of division and was half a point higher than Colorado College (3.52). The Yeomen recorded a nation-leading mark of 3.60 during the fall semester. “Once again this honor illustrates the effort our team puts forth in the classroom as well as in the water,” Head Coach Mark Fino said. To be eligible for the award, a team must compile a minimum GPA of 3.0 during the spring semester. The Yeowomen, who were named to the CSCAA All-Academic Team includeLaura Fries, Kate Melanson and Grace Aheron. This distinct honor goes to those who earned a minimum GPA of 3.5 and also posted an NCAA national qualifying time. 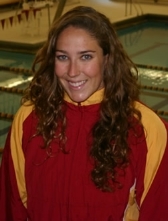 The Yeoswimmers are just a little over two months away before they begin their preparations for the 2010-11 season. The 2010 MAC Football season is quickly approaching and as part of its preview, the league would like to give an inside look into the lives of its Student/Athletes. Senior Ohio defensive end Dak Notestine led the Bobcats with 10 tackles for loss and 6.5 sacks last season. 1. Why did you choose the Ohio University? I chose Ohio Univerisity because my father played at Ohio and I wanted to follow in his footsteps. 2. What were you up to this summer? I'm preparing for a great senior season. I'm also looking to improve my golf game. 3. What is an annoying habit you possess? I tend to bite my nails when I get nervous. 4. Which words or phrases do you overuse? 5. What is the most noteable thing about your hometown of Bellefontaine, Ohio? It is the highest point in Ohio. We also have the world's shortest street (McKinley Street). 6. What are your pregame rituals? I like to listen to the hardest music and also watch my fellow teammate DL Marcellis Williamson warmup. He brings a tremendous amount of excitement and energy to the game. 7. What was your first job? What was your worst job? My first job was my worst job. I worked at a Dairy Queen for my cousin and was given all sorts of tasks that nobody else wanted to do. 8. Besides football, what sport would you have pursued for a college scholarship? I would say basketball. It's always been a passion of mine and I've played the sport as far back as I can remember. 9. What actor/actress would play you in the movie of your life? Why? I would have to say Gerard Butler. If he did half the job he did in the movie 300, I would be pleased. He would probably make my life way more exciting than it actually is. 10. What is one movie you could watch over and over again and not get sick of? It has to be Gladiator. I try and watch it before every game.